Coming with a 1450 mAh battery and a WVGA 3.7″ screen, the Lumia 800 started this test in a slightly more favorable position than its Nokia N9 sibling. The MeeGo flagship features the same battery, but its screen is 0.2″ larger and has 54 pixels higher vertical resolution, so we’d expect the Lumia 800 to do better. 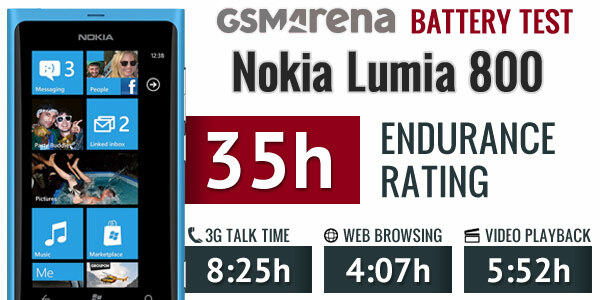 The Nokia Lumia 800 got off on the right foot, lasting for 8 hours and 25 minutes in our first trial – 3G talk time. That’s nearly an hour and a half better than the N9 achievement and, since the screen size doesn’t count here, this suggests that Windows Phone is more efficient at making calls than MeeGo. The Lumia 800 also outdid the other Windows Phone smartphones we have tested so far – HTC Radar and Samsung i937 Focus S.
Sadly, it was mostly downhill from there and it started with the Nokia Lumia 800 mediocre browsing endurance. A fully charged Lumia 800 only took 4 hours and 7 minutes of refreshing web pages with our automated script to deplete its battery. AMOLED screens aren’t particularly good at displaying the predominantly white web pages and the Lumia 800 paid the price here. Strangely though, it did way worse than the Samsung i937 Focus S, which has an AMOLED display as well. 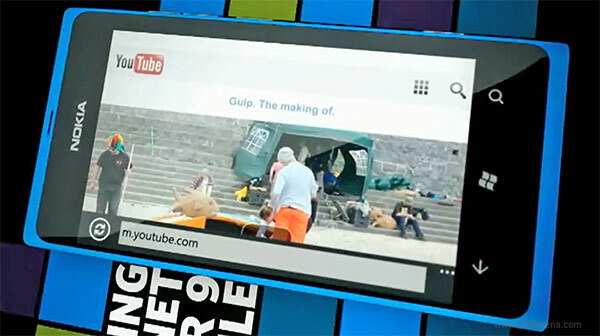 Video playback wasn’t particularly kind to the Nokia Lumia 800, either. The smartphone used 90% of its battery (the trial ends there) after 5 hours and 52 minutes of video playback. It is as good as the HTC Radar endurance, but, unfortunately, it’s much closer to the worst than to the best achievements in this test. As usual, we conclude with the most important of our tests, the overall usage. After the unspectacular performance in the three individual tests we weren’t expecting miracles and, sure enough, the Nokia Lumia 800 got an endurance rating of 35h. That number means that you will have to charge the smartphone every 35 hours if you do an hour each of browsing, video playback and 3G calls per day. That’s an hour more than the HTC Radar score, but 3 hours short of the Focus S achievement. However none of the three WP smartphones we have tested so far has even managed to pass the 40h barrier.